I hesitated to update my previous astrological profile on Trump from four years ago but now it’s time. Like it or not, he has become dominant in recent American political discourse, demonstrating enduring popularity and notoriety on the national stage. Trump formally announced his bid for the Republican nomination for President in June 2015. He has presented himself as different from the usual national politician. He has developed a following devoted to his alleged “telling it like it is”, has shocked and depressed the mainstream Republican establishment, and has managed to dominate the news for many months now – and for the foreseeable future. Several years ago Trump’s strategy to gain attention was to cast doubts on President Obama’s birthplace and he managed to take this fringe issue into the political mainstream. But then an odd event occurred: in typically theatrical manner, Trump was shown supposedly waving his own birth records in a move to get Obama to disclose his (Obama later did). Later we found out that Trump was not waving his birth certificate! Astrologers, however, were intrigued that Trump’s birth time that was later disclosed – 10:54 AM – was about an hour later than the one we had originally used. Astrologers have gotten good information from Trump’s revised birth time. What is Trump’s background? He originally took over his father’s business as a real estate developer and concentrated on Manhattan. He had begun to take over choice parcels of Manhattan real estate and converted them into large and impressive buildings with his name emblazoned on them. The most famous was Trump Towers, the most massive and upscale dwelling complex in New York. With a gambler’s instinct and a flair for the dramatic, Trump has been the talk of that town since the 1980’s. The 1990’s were more difficult, however: a real estate market crash drove him close to bankruptcy. He also had a well-publicized nasty divorce from his first wife Ivana Trump, giving rise to the perception of him as a hedonist and narcissist. He bounced back financially, although the mid-2000’s would bring more financial peril. In spite of his reversals, Trump is worth several billion on a bad day and more than that on a good day, yet much of his wealth may be smoke and mirrors. Today his real estate empire has spread to Atlantic City, Las Vegas, San Francisco and overseas, yet he has had his brushes with massive debt and bankruptcies. During the current campaign there’s been opposition talk about his four bankruptcies which amounted to public bailouts for his enterprises. When asked about this in a current debate, Trump merely stated he was taking advantage of the laws in place. The early 2000’s Trump as a reality TV host for the series The Apprentice. This gave Trump an entertainment presence and a persistent image of him proclaiming “You’re fired!” to some unlucky contestant. You will see that Trump hasn’t changed much. All along there have been several Trumps: the hyperbole addict who prevaricates for fun and profit; the knowledgeable builder whose associates profess awe at his attention to detail; the narcissist whose self-absorption doesn’t account for his dead-on ability to exploit other people’s weaknesses; the perpetual seventeen-year-old who lives in a zero-sum world of winners and “total losers,” loyal friends and “complete scumbags”; the insatiable publicity hound who courts the press on a daily basis and, when he doesn’t like what he reads, attacks the messengers as “human garbage”; the chairman and largest stockholder of a billion-dollar public corporation who seems unable to resist heralding overly optimistic earnings projections, which then fail to materialize, thereby eroding the value of his investment—in sum, a fellow both slippery and naïve, artfully calculating and recklessly heedless of consequences. If you look at the Sun and Moon conjunct the lunar nodes, it means that about a day and a half before Trump was born there was a lunar eclipse. Is this a karmic placement? Doesn’t have to be – perhaps better would be to think of the North Node as being like Jupiter, and with Uranus nearby we have strong indication of Trump’s famous grandiosity. Many astrologers have commented about Trump’s new Ascendant degree being very close to the fixed star Regulus, one of the royal stars. Regulus is affiliated with the planets Mars and Jupiter and signifies regal power and aggression and when rising can signify a prominent or fortunate birth. If you’re going to be a king or empire builder or would like to think of yourself as one, Regulus on the Ascendant is a good start. Again, it is a star of royalty – legitimate or self-proclaimed. The stellar placement with a nearby Leo Ascendant – especially governed by a strong Sun – can be sufficiently self-absorbed and thin-skinned with a pathological focus on appearance and image, in short a narcissist. However, this person may also be a hero, and that is how he is perceived but his many loyal supporters. The placement of Mars in Leo close to the Ascendant gives an aggressive dimension to this combination near the Ascendant. It shows brightly in this present campaign: Trump’s ability to counter-punch has intimidated other Republican candidates and restrained many in the news media – at least until very recently. Mars in Leo is in a fixed sign but is in trine and sextile to his Sun in Gemini and Moon in Sagittarius – the mutability of the signs of the luminaries gives him some flexibility but Mars in a fixed sign gives a steady deliberateness to his many controversial pronouncements and to his adversarial tendencies. Among the Republican candidates only Ted Cruz comes close to Trump’s delight in making enemies – but Trump chooses them more carefully. His is a competitive and confrontational style. This can manifest for good or ill, however. To most people, however, Trump’s priority in life seems to be in furthering his own status and magnitude, not any particular causes he espouses. 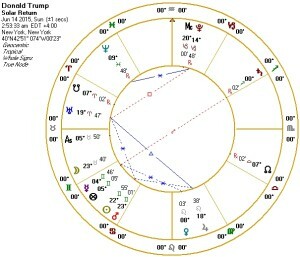 Supplying further confirmation of the importance of Trump’s Mars is that his Lot of Spirit (the relationship between Sun and Moon) is conjunct by degree his Lot of Courage (the relationship between the Lot of Fortune and Mars). More Mars but her allied with his “soul” or daemon. The lord of Trump’s Leo ascendant is the Sun in Gemini, placed fortunately in the 11th place of Good Spirit. Sun is also conjunct the Lot of Exaltation that is derived from the distance from the Sun’s degree of exaltation to the Sun’s natal position. This is also an indication of fortune, at least the personal confidence that can lead to fortune. In his case confidence borders on boorishness, and sometimes crosses the line completely. We then take note of Mercury, the planet of the marketplace, and, to cite his well-known book, the Art of the Deal. At first Mercury does not exactly impress: it is in the 12th and in the very un-mercurial sign Cancer. Mercury is also conspicuous in its square from Neptune. There are plenty of people with Neptune is square to Mercury who are perfectly honest and forthright in their dealing with others and no more prone to self-deception than the rest of us. However in Trump’s case these features of Neptune-Mercury seem to manifest. Additionally this configuration may denote Trump’s lifelong ability to tap into the collective unconscious of many Americans – the materialistic America who creates heroes of wealthy entrepreneurs and now those who ascribe to his current nativist traditions. It seems that there should be more. When we note the sign and degree position of Mercury in Cancer, governed by his Moon in Sagittarius, we’re getting closer…. 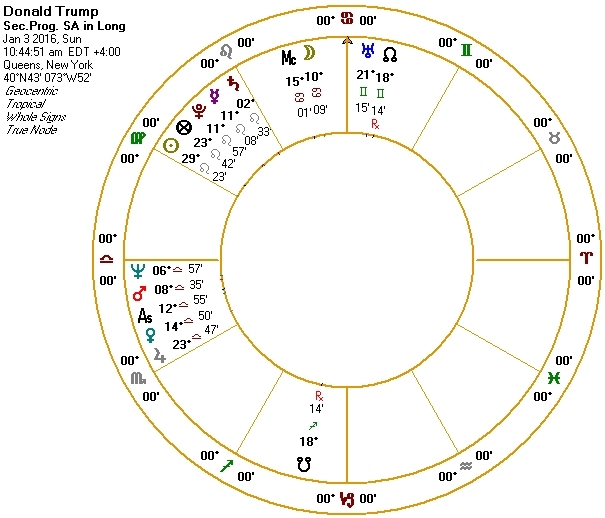 Trump’s Mercury’s condition is more powerful because it forms a contra-antiscion relationship with the Moon – in modern astrological parlance we might say the midpoint between Moon and Mercury is 0° Aries. When Mercury and Moon work together we certainly get “The Art of the Deal” that combines Mercury’s craftiness with the Moon’s intuitive sense of others. 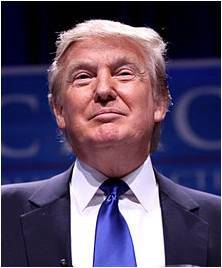 Mercury and Moon in this relationship is a potent combination that accounts for some of the untutored political genius Trump has demonstrated – he knows people well and cultivates his own very well. 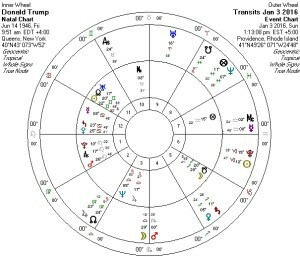 Trump’s Jupiter is not as prominent as one would expect: its strongest quality is its trine and sextile to the Sun and Moon respectively and is the dispositor for the Moon. Jupiter in Libra also corresponds nicely to an “art of the deal” and an ability to assess an environment well. Again, his motivation seems not ideological but an advancement of himself for its own sake. This leaves us with the Venus/Saturn combination in Cancer in the 12th. Venus is in triplicity and Saturn is in detriment, yet Saturn is in its joy in the 12th. This does not bode well for Trump’s love life and there’s probably a tendency to become demanding and dictatorial with women once he has married them. One can also see Trump as a traditionalist when it comes to relationships. Looking at the astrology, what are Trump’s chances in this coming year? Do you really want to know? I will use the same predictive indicators for Trump that I would use for my client updates, roughly in the same order. 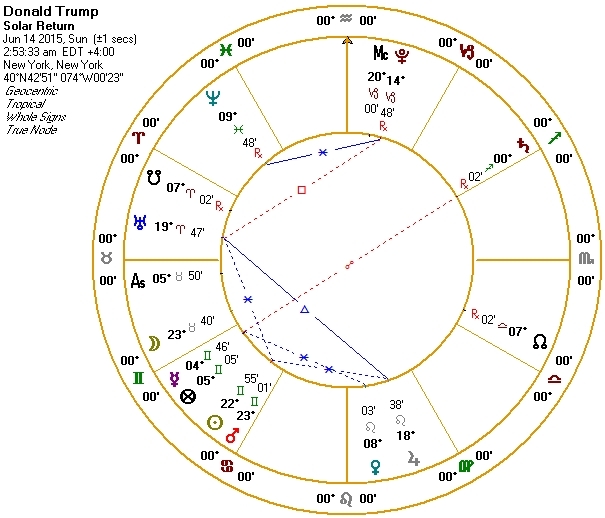 We can begin right now by looking at Trump’s transits from Jupiter in Virgo to his Sun in Gemini and Moon in Sagittarius and we easily note that Jupiter currently bisects his two luminaries together in an extended station and this does give him prominence right now. 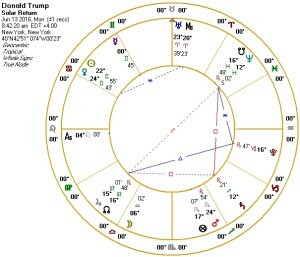 In case you are thinking that this signifies that Trump is “peaking too early” and he will gradually become less a political factor, note from the graphic ephemeris below that Jupiter, having gone through its retrograde period, will bisect his Sun-Moon once again – in July that is the time of the Republican convention. Jupiter may carry him far, at least until the nominating convention. But then Jupiter goes into Libra and becomes less a factor for him. There are two other noteworthy transits from outer planets in 2016. During the spring Pluto in Capricorn forms a square to his Jupiter in Libra – this has the feel of a journey that turns dark and difficult. During the second half of the year Uranus in Aries has a station in square to his Saturn in Cancer that could incline more toward the unpredictable. However, noting that Saturn governs his seventh house of relationships and is conjunct Venus in his natal chart, some marital or other interpersonal skeletons in the closet may mar his political journey next year. Looking at today’s news, it’s probably that this transit may relate to an independent Presidential bid. Trump’s secondary progressions are as well. His progressed Sun changes from Leo to Virgo in early August. I don’t expect anything significant to happen exactly at that time, but it does denote a gradual change of emphasis from the heroic (at least in his mind) to the more pragmatic. However, echoing the Pluto transit to his Jupiter, progressed Mercury is conjunct his progressed Pluto this year and it is exact next autumn. A number of my friends already think he’s been sufficiently Pluto-Mercury in style and it’s no coincidence that the two progressing planets have been occupying the same degree since Trump has been making incendiary statements about immigration, building walls between Mexico and the US, terrorism, restrictions on Muslims, and the like. Since the progression will continue until September of next year I do not expect this unpleasant habit to stop very soon. I restrict my use of secondary progressions to progressed-to-progressed but there is an alternative. Solar arc directions, whereby everything is directed at the rate of the progressed Sun, reveals something about this present moment for him. (It may also verify the accuracy of his birth time.) On November 30, just before his and the nation’s attention turned toward ISIS-allied terrorism and Muslim immigration as a national issue, Trump’s directed Sun (his progressed Sun by definition) was exactly conjunct his natal Ascendant. The directed Sun can show the manifestation of one’s basic character and, on the Ascendant, radiates outwards, perhaps loudly. For an image-driven politician whose purpose is to focus attention on himself, this timing couldn’t be more perfect. These times show Trump on full display, like it or not. Since Trump announced his candidacy close to his birthday, a look at solar returns is in order. They supply additional information but they are not remarkable in themselves. Here is the one for this year of his life. There are some noteworthy features of this chart. Moon is in the first and is not far from his natal Mars placement and this may be helpful in his perception of the zeitgeist, the tenor of the times. And he has well-used his Mars well. This may be good for him but not necessarily for anybody else. Moon has some aspects, notably a square from Jupiter, but is void of course for the year. It’s a strong Moon but its final results may be disappointing. I am intrigued by the strong Gemini here, especially Mercury in its diurnal home sign, oriental and conjunct the Lot of Fortune. As with his natal chart, Gemini speaks of his ability to pivot rhetorically and his presentation of many dimensions of himself to others. The Lot of Fortune is important in a politician’s chart – to what extent do outside circumstances dictate his or her agenda and show himself or herself, synchronized or not with the spinning of the nation’s Wheel of Fortune? For Trump, so far so good. This may change next year. So, you may ask, what’s the following year like for him? This solar return is a lot like his natal chart, with Leo rising and Sun in the 11th place. The ruler of the year is Venus that is conjunct the ruler of the Ascendant – Sun – and is also the dispositor for the Moon. Both Sun and Venus have strong sextiles to Uranus and the Midheaven degree, possibly indicating Trump’s persistence as a thorn in the side of media and conservative establishments – all with a smile on his face. Mercury is still quite strong in this chart – oriental, in sect and in its own diurnal sign. It is also the “lord of the year” for his profected Ascendant, and this time Mercury is not bothered by a difficult aspect from Saturn. It bodes well for Trump to make deals, to outwit his opposition. 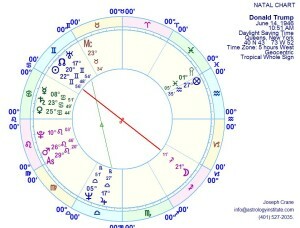 I am bothered by Mars being close to his Lot of Fortune and governing the Lot of Fortune in this Solar Return. Trump has recently reaped short-term benefit from America’s current concerns with terrorism, ISIS, and the like. This raises the possibility that he might benefit once again from some kind of terrorist strike or national calamity brought about from adversarial forces. This may enhance his chances of being elected President although I don’t think this is sufficient. 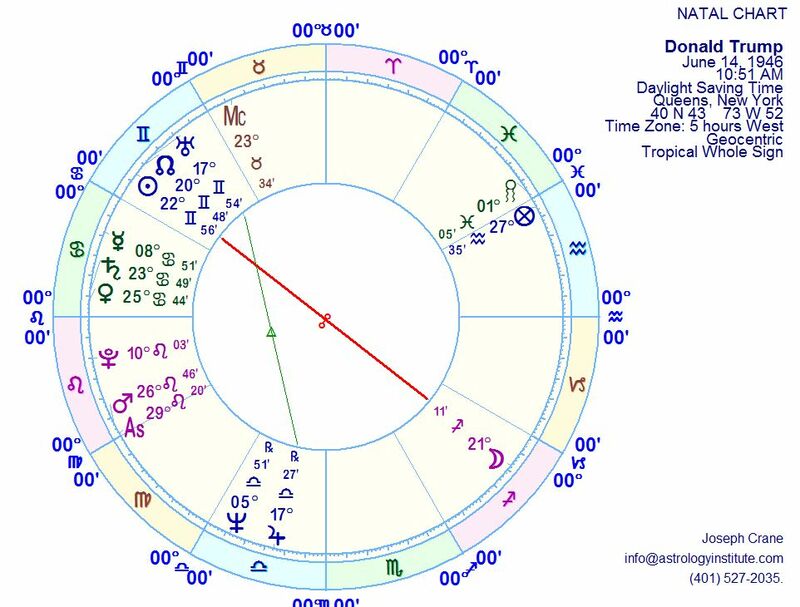 Mars, strong and angular but out of sect in this diurnal Solar Return chart, may strike back at Trump, making him a victim of his own Martian excesses. I begin with decennials, for that is the ancient system I explored most extensively in my book Astrological Roots. Trump entered a Moon/Moon period early in 2010. This means that the general time lord will be for the following ten years nine months (in 360-day years) but the specific time lord, the more important one, was active for twenty five months (of 30 days each). 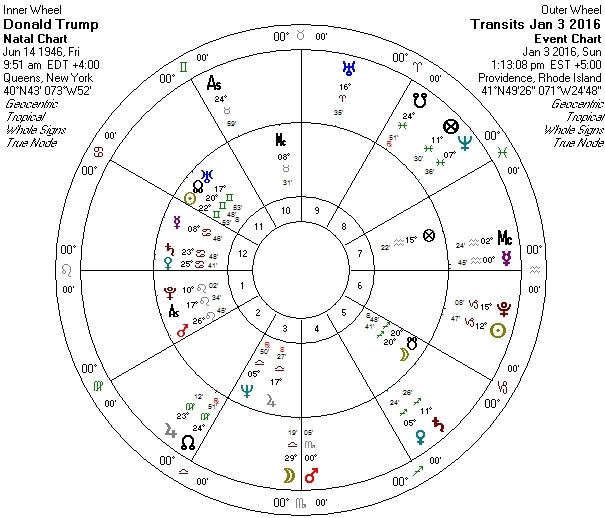 Following that, in the order of planets in Trump’s chart, would be Moon-Sun for 19 months and then Moon-Saturn that began in April, a few months before declaring his candidacy. In this decennial Moon in happy-go-lucky Sagittarius is modified by the presence of Saturn until September 2017. In typical Saturnine way, Trump’s fan appeal has been gradually balanced by an increasing number of people uncomfortable to apoplectic at the prospect of a Trump presidency – these would be considered his “unfavorables” and they’ve hardened to the point where it will be difficult for him to gather further support. I expect his political appeal to reach its own ceiling perhaps in the days and months ahead. 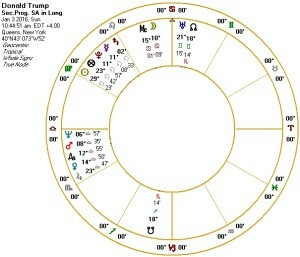 Looking at zodiacal releasing from Fortune, Trump was in a longer Gemini period beginning in 2010; when he began his current campaign it was Gemini-Leo from March 2014 until this past October. This is quite positive for him, accentuating his Gemini Sun and Leo rising with Mars also there. However, this changed to Gemini-Virgo from October 10; Virgo is far less prominent in his chart and places focus on Mercury that is not as strong as his Sun. Clearly his finger on the pulse of his supporters, actual or potential, continues to be there. However his personal presence and charisma may find their natural limits. Bringing these different factors together, here’s my prediction for Trump’s candidacy. He will maintain a high profile and continue in the race, since he has much backing and money at his disposal. Yet both have reached their limits. He may receive the nomination or run as an independent, since either will make him an important person during the coming year. However he does not have the strength to develop further beyond what he has already accomplished and I doubt that would be enough for him to prevail in a national election. The indicators just aren’t there, nor are they from a common-sense reading of the American political situation. This doesn’t mean he isn’t scary or his cause potentially dangerous to American values. It is possible that Trump goes “full fascist” and allies with various right-wing militias to form his own paramilitary. However, Mars does not strike me as particularly prominent in the coming year for him, nor is he at all self-destructive, for he is far more important to himself than any cause he allies himself with. At bottom Donald Trump, entertainer and self-promoter with a large checking account and media presence, is more like Silvio Berlusconi than Benito Mussolini. I have nothing to add or critique, but just want to thank you for this very good and thorough examination of Trump’s chart, as I see you also did with Sanders’. Though I bought your Astrological Roots book at ISAR conference 2014 — the only book I bought there, by the way — somehow I didn’t take in and use the decennials. I guess I’d better read that section, at least, again. I particularly appreciate your combination of astrological evidence and common sense reading of the political pulse. Thanks. I thought Trump would peak in the spring, with Jupiter squaring his Sun-Moon combination and perhaps when Jupiter moves on things he will have less of a charmed life at the polls. Over time I’ve grown quite accustomed to using decennials in my predictive work, in addition to features most modern astrologers use. I use other Hellenistic planetary period systems less but I still look at them and take note. I figure my Hellenistic book to be a reference book for ancient astrology and have been pleased that many have used it in that way. Using profections, his ascendant (first house) comes to Gemini for 2016 when he turns 70. Doesn’t that make Mercury the ruler of the year? For his 2016 solar return, you said Venus was ruler of the year. Unless I misunderstood something, she would have been the ruler for 2015 when the profection was in Taurus. thanks – I hope your predicted outcome is correct. It is now June 2016 and so far your assessment has been spot on.